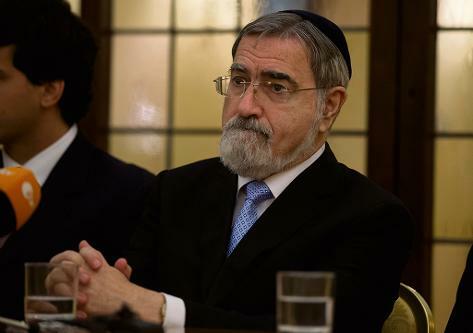 THE cure to the religious violence that is the "fundamental challenge of the 21st century" lies in theology, Rabbi Lord Sacks argues in a new book that offers scriptural exe­gesis instead of political solutions. In Not in God's Name, published this week, Lord Sacks, the former Chief Rabbi, argues that the West's contemptuous and ill-informed ap­­proach to religion has deprived it of religion's capacity to heal. "If we do not do the theological work, we will face a continuation of the terror that has marked our century thus far; for it has no other natural end," he writes. "The very texts that lie at the root of the prob­lem, if properly interpreted, can provide a solution." All three faiths must ask "the most uncomfortable questions". The book traces religious viol­ence to social and psychological pro­­­­cesses, and argues that mono­theism has frequently failed to im­­munise against them. "Historically, the great monotheisms have not been in the vanguard of tolerance,"
Lord Sacks says. Believers have been taught that "you must share our faith to be fully human." Reli­gions make it "almost impossible" to put yourself in the place of those you believe to be in error. He goes on to offer a rereading of Genesis texts which suggests that woven into them was an antidote to this poison: a lesson in empathy and the universality of God's justice. Lord Sacks argues that, when a terrorist or military group invokes God, "to deny they are acting on religious motives is absurd." "Deep down what is at stake is all political problems", he said on Tuesday. "But you can only find polit­ical solutions if parties are willing to see this as a political problem. The second that one defines it in religious terms, then you have to address the religious issue. . . What in politics is a virtue in religion is seen as a vice: namely, compromise." He argues that religion and politics are now so segregated in the West that "we are losing some of the power of religion to heal rather than to harm." The West has often had "no serious response" to religiously motivated violence beyond "ridicule and crude assaults". He spoke of the "brilliant" Alexandria process of dialogue in Egypt, convened by Lord Carey: "It was a real breakthrough, but in the end it did not mesh with the political process at any point: it was not recognised as a track to diplo­macy, which it should have been." While he is confident that a rereading of the Qur'an could take place within Islam, given that it was once a "world leader in this field", he accepts that the current strain of Wahhabism is "not open" to such an approach. "This book is not an attempt to find an instant solution, but saying: if it took 50 years to raise a generation of Wahhabi activists, it may take 50 years to raise a gen­eration of young Muslims who will find another way." In the book, he traces Islamist violence today to "a series of deci­sions half a century ago that led to the creation of an entire educational network of schools and seminaries dedicated to the proposition that loving God means hating the enemies of God". This was fuelled by "Western petrodollars". Today, the Arab and Islamic world is "awash with Judeophobia" he writes, and, in the West, anti-Semitism is "now usually disguised as anti-Zionism". He dismisses the argument that Islamist attacks on Jews are about the conflict between Israel and the Palestinians, referring to attacks in Paris and Mumbai, and anti-Semitic content in sermons and TV broadcasts by Muslims. But what of Israel's record? "There is a very deep thrust in the Hebrew Bible of striving to under­stand the stranger, to love the stranger," he said on Tuesday. "I really feel that the time has come to look at that teaching very deeply. . . Very often, political figures feel there is not a lot of help we can get from religious leaders. They are not necessarily preaching that mes­sage. I certainly think I have met Israelis who take that very seriously indeed. . . . I think we have looked at political solutions for so long. That has failed, and the time has come to look at what are we teaching our children and young leaders, and break­ing down these barriers. "It should not be beyond the imagination of the People who taught us to empathise with the stranger."